Founds a School at Maḥoza. Babylonian amora of the fourth generation; born about 280 C.E. at Maḥoza (where his father was a wealthy and distinguished scholar); died there in 352 (Sherira, in Neubauer, "M. J. C." i. 32). In his youth Raba went to Sura, where he attended the lectures of R. Ḥisda and associated with Rami b. Ḥama. About ten years after the latter's death Raba married his widow, the daughter of R. Ḥisda (Yeb. 34b). The teachers of Raba were R. Joseph, Rabbah, and, chiefly, R. Naḥman b. Jacob (who lived in Maḥoza). The chief companion of his studies was Abaye, who was about the same age, and both of them developed the dialectic method which R. Judah and their teacher Rabbah had established in their discussions of tradition; their debates became known as the "Hawayot de Abaye we-Raba" (Suk. 28a). Raba surpassed Abaye in dialectics; his conclusions and deductions were as logical as they were keen, whereas those of Abaye, although very ingenious, were not always sound. When, after the death of R. Joseph, Abaye was chosen head of the Academy of Pumbedita (Hor. 14a), Raba founded a school of his own in Maḥoza, and many pupils, preferring his lectures to those of Abaye, followed him thither (B. B. 22a). After Abaye's death Raba was elected head of the school, and the academy was transferred from Pumbedita to Maḥoza, which, during the lifetime of Raba, was the only seat of Jewish learning in Babylonia. 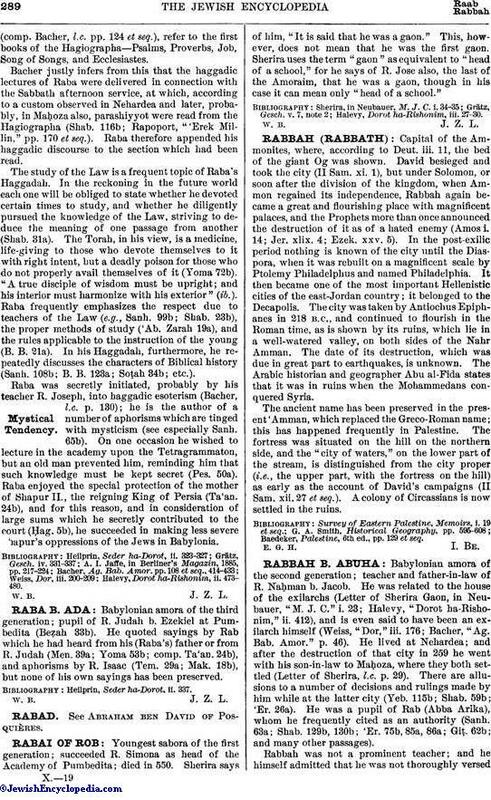 Raba occupied a prominent position among the transmitters of the Halakah, and established many new decisions and rulings, especially in ceremonial law (e.g., Hul. 42b, 43b, 46b, 47a, b; Pes. 30a). He strove to spread the knowledge of the Halakah by discoursing upon it in lectures, to which the public were admitted, and many of his halakic decisions expressly state that they were taken from such discourses ('Er. 104a; Shab. 143a; Pes. 42a; B. B. 127a). He was a master of halakic exegesis, not infrequently resorting to it to demonstrate the Biblical authority underlying legal regulations. He adopted certain hermencutic principles which were in part modifications of older rules and in part his own (comp. Bacher, "Ag. Bab. Amor." pp. 131-132). He was regarded as a greater authority than Abaye, and in cases where there was a difference of opinion between them Raba was generally followed; there are only six instances in which Abaye's decision was preferred (Ḳid. 52a). 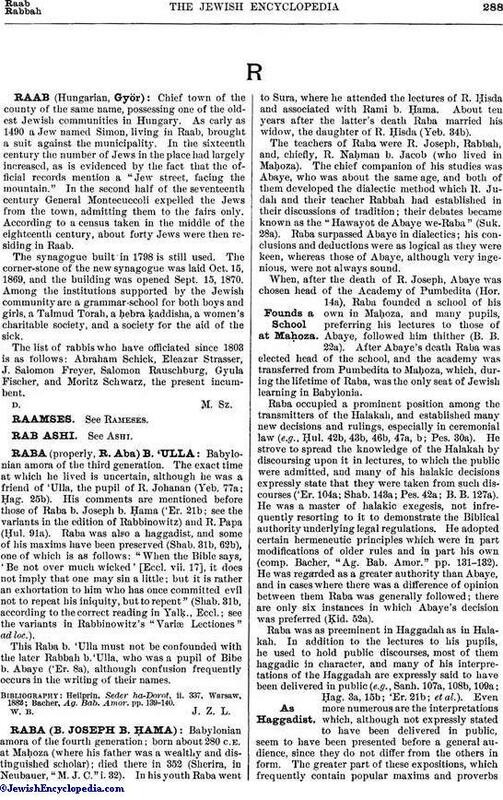 Raba was as preeminent in Haggadah as in Halakah. In addition to the lectures to his pupils, he used to hold public discourses, most of them haggadic in character, and many of his interpretations of the Haggadah are expressly said to have been delivered in public (e.g., Sanh. 107a, 108b, 109a; Ḥag. 3a, 15b; 'Er. 21b; et al.). Even more numerous are the interpretations which, although not expressly stated to have been delivered in public, seem to have been presented before a general audience, since they do not differ from the others in form. The greater part of these expositions, which frequently contain popular maxims and proverbs(comp. Bacher, l.c. pp. 124 et seq. ), refer to the first books of the Hagiographa—Psalms, Proverbs, Job, Song of Songs, and Ecclesiastes. Bacher justly infers from this that the haggadic lectures of Raba were delivered in connection with the Sabbath afternoon service, at which, according to a custom observed in Nehardea and later, probably, in Maḥoza also, parashiyyot were read from the Hagiographa (Shab. 116b; Rapoport, "'Erek Millin," pp. 170 et seq.). Raba therefore appended his haggadic discourse to the section which had been read. The study of the Law is a frequent topic of Raba's Haggadah. In the reckoning in the future world each one will be obliged to state whether he devoted certain times to study, and whether he diligently pursued the knowledge of the Law, striving to deduce the meaning of one passage from another (Shab. 31a). The Torah, in his view, is a medicine, life-giving to those who devote themselves to it with right intent, but a deadly poison for those who do not properly avail themselves of it (Yoma 72b). "A true disciple of wisdom must be upright; and his interior must harmonize with his exterior" (ib.). Raba frequently emphasizes the respect due to teachers of the Law (e.g., Sanh. 99b; Shab. 23b), the proper methods of study ('Ab. Zarah 19a), and the rules applicable to the instruction of the young (B. B. 21a). In his Haggadah, furthermore, he repeatedly discusses the characters of Biblical history (Sanh. 108b; B. B. 123a; Soṭah 34b; etc.). Raba was secretly initiated, probably by his teacher R. Joseph, into haggadic esoterism (Bacher, l.c. p. 130); he is the author of a number of aphorisms which are tinged with mysticism (see especially Sanh. 65b). On one occasion he wished to lecture in the academy upon the Tetragrammaton, but an old man prevented him, reminding him that such knowledge must be kept secret (Pes. 50a). Raba enjoyed the special protection of the mother of Shapur II., the reigning King of Persia (Ta'an. 24b), and for this reason, and in consideration of large sums which he secretly contributed to the court (Ḥag. 5b), he succeeded in making less severe Shapur's oppressions of the Jews in Babylonia. Halevy, Dorot ha-Rishonim, ii. 473-480.